Lesnar: "I'm a Dodge guy. I always have been, and I always will be." 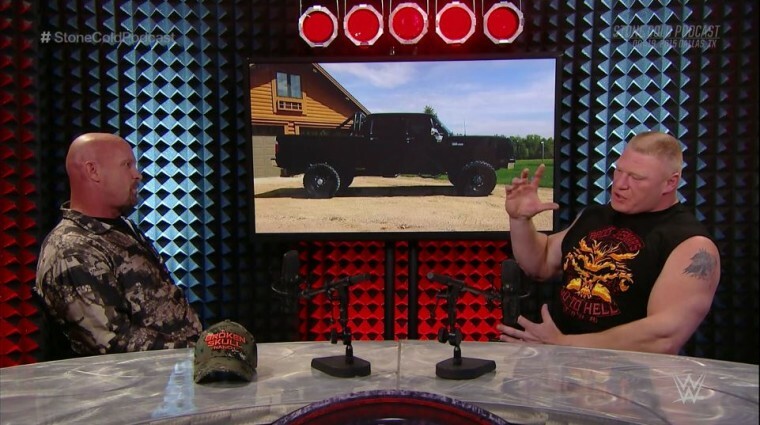 This past Monday night, wrestling fans tuned into the WWE Network after another eventful (read: the complete opposite of eventful) episode of Raw to see “Stone Cold” Steve Austin sit down for a one-on-one interview with the eater of Cadillacs, Brock Lesnar. Much of the audience was expecting the revelation that Austin would come out of his 13-year retirement to face off against The Beast Incarnate at WrestleMania 32 in Dallas next year—despite Austin himself denying as much repeatedly. Instead, they got an affable conversation between two friends about everything from wrestling and mixed martial arts to hunting, whiskey, and trucks. As a means to introduce Brock Lesnar as a human being to an audience almost entirely familiar with him only as a suplex-throwing behemoth, Austin asked the former UFC World Heavyweight Champion about his brand preferences when it comes to trucks. Lesnar outed himself as “a Dodge guy,” and when a picture of his prized pickup was shown on-screen, Lesnar beamed and laughed with pride just the way a normal human being who doesn’t destroy other human beings for a living would. To this effect, Austin’s plan to humanize the beast was a resounding success. Stone Cold: I know you drive a truck. You’re an outdoor guy; you’re an avid hunter, fisher, just like myself. Ford, Chevy, Dodge? Whatcha got? Lesnar: I’m a Dodge guy. I always have been, and I always will be. I’m a Mopar fan. I’ve got Mopars myself. I’ve got a ’68 Road Runner, my dad’s got a 1969 Super Bee, I’m driving a 2014 Dodge Ram three-quarter-ton. But it’s not…I don’t have it all geeked up. Stone Cold (pointing to a picture of the truck): Tell me ’bout this guy right here! Lesnar: That’s my baby, I left that one for last. Stone Cold: Brock sent me this on a text message, and he don’t ever brag about what he’s got, but I got a Dodge Ram Charger I shared with him. Tell me ’bout this sumbitch right here ’cause this is badass. Lesnar: That’s…that is my million-dollar project. I rescued that truck out of South Dakota, it made it all the way to Minnesota, I had a guy work on it…I had this vision in mind of what I wanted it to look like when it was done. I converted that truck, it was a 360 (cubic-inch) gas (presumably the Magnum V8), and I put a 5.9-liter Cummins in it. I won’t bore you with the rest of it, but it’s a 1978 Dodge Power Wagon, it’s got a brand new interior in it, and that’s my baby girl. Stone Cold: That’s badass. That looks like Brock Lesnar. Lesnar’s truck appears to be a Dodge Ram 250 circa 1993 with a Quad Cab-modified Power Wagon cab spliced in; whatever it truly is, it is a monster that is most definitely emblematic of its owner. One could nitpick Brock for initially calling it a 2014 model if one so chose, but I’m of the opinion that if Brock Lesnar says his truck is a 2014, one should just be inclined to just agree if one values one’s life. Now that Lesnar has revealed his allegiance to Dodge, one has to wonder if the automaker will make him an offer for a sponsorship deal. Granted, Dodge is allegedly not particularly worried about appealing to the wrestling crowd, but Lesnar is something of a transcendent figure given his athletic background and his mainstream appeal. Also, I’m pretty sure that if an ad for Ram trucks consisted of Lesnar pointing at the camera and ordering the viewer to buy a truck, people would do as they are told. Think about it: what better way for Dodge to combat Ford and their acquisition of former pro-wrestler The Rock as a spokesperson than to turn around and trot out Brock on its behalf? After all, the last time those two guys went head to head, things went pretty well for Lesnar.